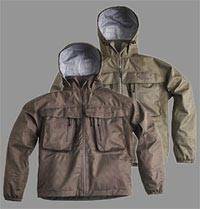 Some of the best Waterproof Fishing Jackets boat jackets and waterproof wading jackets available in the UK, including special offer discounts. The all-weather parka is made from waterproof Climatex material and is insulated to keep you both warm and dry. Made from 3 layer Climatex material, the wading jacket will keep you dry in the harshest of weather conditions. Ergonomically cut with features to benefit the most demanding of anglers. The result of rigorous testing by Grey's expert team, the new Strata Wading Jacket is the perfect all-round fishing jacket - lightweight, ergonomically cut and including their specially designed Flo-Guard cuffs to reduce the unpleasant trickle of water up your sleeve while casting. The Laino Wading Jacket is the new Loop flagship and workhorse. 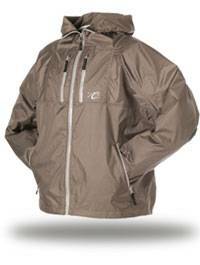 With a durable 3-layer high performance polyamide fabric this jacket will keep you dry and comfortable by the river, year after year. Laino has the characteristic three chest pocket and tool pocket solution perfected by Loop. 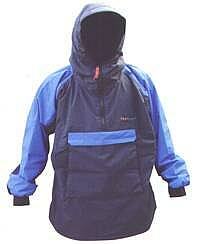 In addition fleece lined hand pockets with YKK water repellent zippers and an arm pocket for keys or phone. This makes it easy to carry a lot of gear with you while fishing your favourite beat. The hood has a extended peak with wire to fit perfectly over you cap, keeping the rain out of the face. The hood has elastic cord adjustments both in front and back for a great fit. The front is equipped with two press buttons, one at the bottom and one in the middle. These buttons let you have the jacket fully unzipped for full ventilation without having the jacket flapping around. 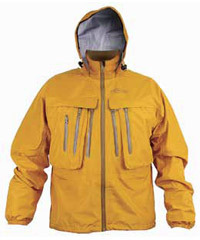 The Rautas LW Wading Jacket is designed to be your shelter when you don´t need to pack all your gear. Combined with a backpack or a hip bag, this is really all you need. The design of the jacket focuses on packability, weight and breathability. With a light 2,5 layer polyamide shell fabric, this jacket packs very small and with a weight of only 390 grams it is a great weather barrier when hiking in the mountains or fishing. At the sides you will find two zippered openings that work as ventilation flaps and also let you easily access the inside of the jacket. The front is equipped with two press buttons, one at the bottom and one in the middle. These buttons let you have the jacket fully unzipped and ventilated without the jacket flapping around. The Rautas also has two chest pockets for the essentials and hidden loops for attaching tools. If you need to be comfortable, remain dry and carry only but the key essentials to enjoy a great days fishing, the SADE jacket is an ideal choice. With a modern clean design in both standard and slim fit, the 3 layer fabric is designed to repel water yet allow moisture to be expelled to ensure your comfort on a long day. Storage is within 4 large front pockets secured with YKK® Aqua Guard® water resistant zippers as well as a selection of neatly hidden accessory loops for the items which need to be close at hand. 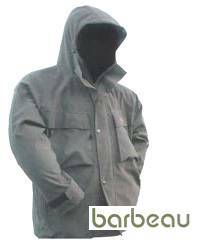 A new, improved version of the old Classic Wading Jacket, but 2" longer so it can be worn in a boat, with the over-trousers. The 3-panel integral hood is fully adjustable and can be rolled away into the collar, when not required. 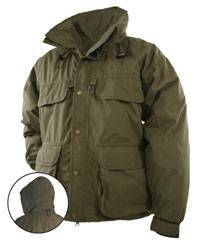 Size S 36/38"M 38/40"L 40/42"XL 42/44"XXL 44/46"
Weve all been caught out by the weather when we wished wed taken a waterproof! Snowbee's new Mini-pack Wading Jacket solves the problem. Packing down into a carry bag measuring an amazing 7" x 3.5" and weighing a mere 320g, the Mini-pack still packs a mighty punch in terms of specification! 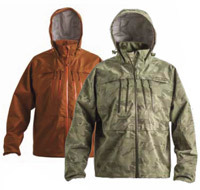 Redingtons premier waterproof jacket. Utilizing sonic welding technology, this jacket offers superior comfort and all the right features. 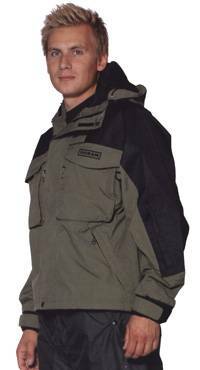 Keeping the versatility but upping performance this jacket has an improved waterproof, breathable fabric system providing supreme protection and comfort for anglers at an incredible price. 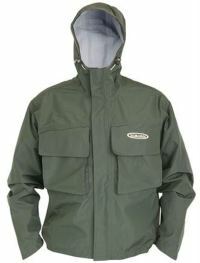 Functional tackle jacket made in a flexible polyester/PU material with many special designed features. Large pocket on the rear and elasticated hogs for tackle gear. Dupont Cordura re-enforcement on shoulders and on the rear of the sleeves. Adjustable functional hood and velcro and neoprene sleeves closure. This technical jacket is made with the best materials and components available. It features Riri®s highly water resistant Aqua Zip® main zipper and YKK®s AquaGuard® zippers on pockets. The cut is a bit longer and slimmer fit type with strongly curved sleeves. 6 pockets, including a big cargo pocket on back, give you a lot of space for your boxes and accessories. The fleece lined high collar protects your neck from nasty winds even when the hood is down or rolled inside the collar. Kura is a slim fit three-layer jacket, made from F3.5 fabric. It has a roomy bellows pocket on each side and soft hand warming pockets behind. It doesnt have internal lining to reduce breathability or making it slower to dry. A jacket to keep you fishing in the worst of conditions. 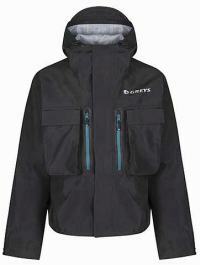 This breathable and waterproof jacket has two large chest pockets for fly boxes and other bigger accessories. The smaller pockets inside and out help you to keep the rest of your stuff in good order whilst the fleece lined hand warmer pockets feel great in cold weather. Hood is adjustable and so is the hem. Typically we all have a rain jacket laying around, but how many of us have one that weighs 14 ounces and stows into its own case? Not many! Now, how many of those have our quality? That would be zero. Need we say more? These high performance jackets work well and look great! The strong but light 3 layer fabric is breathable and quick drying. A no-seam shoulder cut, four large water-resistant cargo pockets, fleece lined handwarmer pockets and YKK AquaGuard zippers are just some of the features on-board. A 3 way adjustable storm hood and water repellent "no tangle" adjustable cuffs give protection when other have left the water. Two colours ro choose from! 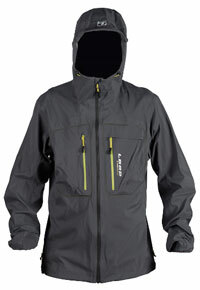 The durable 3-Layer Vector jacket is a brand new design from Vision. Built from F3.5 fabric, it doesnt need a mesh lining, so you will dry this jacket quickly even if you waded a bit too deep! Roomy bellows pockets, lined hand warming pockets and a zipped Chest pocket safely behind the storm flap offer great storage. Vector offers an outstanding combination of features and performance at a modest price! 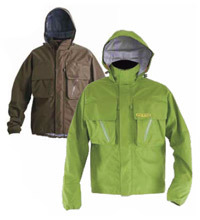 A mid-length jacket, designed for the boat angler, or the bank fisher, who wades. Teamed up with our high-waist over trousers, this makes the perfect boat fishing outfit. 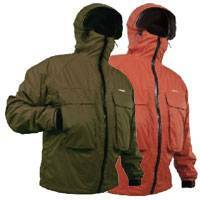  2-way front zip, 4 main Velcro flap front pockets, 2 fleece-lined hand-warmer pockets.  Elasticated waist draw cord for a snug fit. 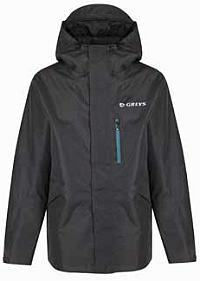  Adjustable hood concealed within the high collar. 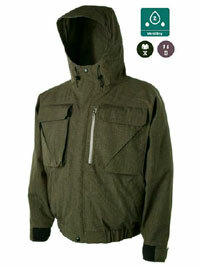  This stylish jacket is equally suitable for general leisure use, as it is for fishing. Reinforced with Supplex providing shower and wind protection. Very light weight and packs very small. Fly pockets and double front closure.